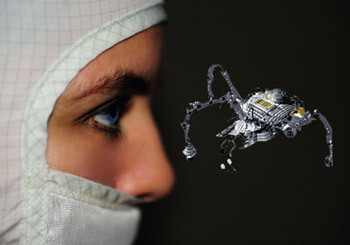 Nanorobot is any artificial machine with overall size of the order of a few micrometers or less in all spatial directions and constituted by nanoscopic components with individual dimensions in the interval 1-102 nm . The exploitation of nanobots for medical application was already discussed in the late 1960 (e.g., in the movie Fantastic Voyage), and in the last 10 years it has become a matter of scholar debate (see  for a recent review). - suitable for being manufactured by processes compatible with today and likely tomorrow semiconductor industries. In tackling these challenges it is important to take into account that, in view of their limited size, nanobots are necessarily devices with very limited computational resources and their interaction can only happen locally. Although at first sight these facts seem to make the challenges really daunting, however, the Mother Nature provide us many examples of tiny living beings with very limited resources but able to perform complex tasks. In fact it is enough to think about insects living in colonies (like ants, bees, wasps and termites) to find beautiful examples of activities apparently requiring intelligent planning and supervision: foraging, nest building , group transport and forming chain to pass obstacles. In this light, it could be a good suggestion to base the algorithms for nanobot control on swarm intelligence  - the collection of techniques and algorithms inspired by the collective behavior of social-insect colonies and other animal societies. In fact ideas regarding swarm of nanobots have already been presented in literature. Methods that use self-assembling agents (nanobots) are discussed in  and . The scientific theory characterizing the greatest progress in the second half of the 20th Century has certainly been the molecular biology of the gene. To some extent this theory may be summarized in the Central Dogma of Biology: the deoxyribonucleic acids (DNAs) either make their copies (replication) or make ribonucleic acids (RNAs) (transcription), and RNAs make proteins (translation) . Taking into account that DNA duplication has a certain failure probability, the Central Dogma describes life as dominated by chance and necessity . Molecular biology may collectively be viewed as a reductionistic theory of life where the healthy or ill state of any living organism is totally contained in its genetic code (DNAs) and the way it is expressed (proteins). As far as the complete and continuous surveillance of the entire molecular pattern of an organism seems beyond any current possibility, the first problem is the identification of the appropriate surveillance level: genes, cells or blood. Among them, the level that seems to pose less technological issues is the blood one. Consequently we focus on the idea of injecting nanobots in the circulatory system. A device with area of 1-2 x 102 μm2 hosted on a substrate of thickness 1 μm has size comparable with that of blood red cells. Thus, provided that it is adequately shaped (for instance, as an ellipse with major axis 2a ≈ 30 μm and minor axis 2b ≈ 4 μm) and terminated, the device can move quite freely through the entire circulatory system. Hence the idea of surveying the state of the organism with swarms of nanobots in the blood. The organization of higher organisms is based on the specialization of the various organs to specific functions (locomotion, vision, hearing, digestion, etc.). This result is obtained specializing the expressome to the task, so that cells with the same genome are expressed within the same organism in very different forms. All the functions of the organism are supported by organs requiring an adequate input of energy and neg-entropy; their needs are satisfied centralizing the collection of energy and neg-entropy and distributing them to the various organs through the circulatory system. The circulatory system can be described as a complex tree forming a double canopy inside each organ. The apparatus is so built that energy-rich substances and O2 can escape from it (thus feeding nearby cells) only in the canopy. This is generally possible only associating with each branch of the canopy a basin where the anabolites are distributed and the catabolites are collected and eventually delivered to to the secretion apparatus. This basin, where the transport of matter is dominated by diffusion, will be referred to as diffusion basin. The union of all diffusion basins must embed all the living parts of the organism. The above argument implies that a nanobot in a capillary could feel the metabolic pattern of the family of cells fed by the capillary itself, thus surveying the cells contained within a diffusion length. The surveillance system for in vivo monitoring can be thought as constituted by two parts: a central unit, externally accessible but permanently resident in the organism (e.g., as an earring), and a swarm of nanobots. In Ref. 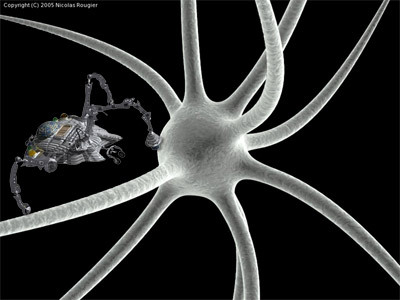 it was hypothesized that each nanobot is a self-propelled machine, taking energy from the environment, able to recognize and dock the target cell, to sense its membrane and neighborhood, to recognize its health state, to store the information, to transfer it to the central unit, and eventually (once allowed) to destroy the malignant cell. Today a swarm so done (actually an auxiliary immune system) seems beyond current possibilities; we now believe something similar can be achieved specializing the agents of the swarm to diagnosis (scouts) or to therapy (workers). A roadmap for nanobot diagnostics can since now be defined; more difficult is instead to imagine a general framework for the use of nanobots in therapy. A scout is nothing but a circulating nanolaboratory for blood analysis in situ. The advantage of the scout swarm over conventional blood analysis is obvious: even a non-invasive swarm of 106 scouts guarantees that each capillary is checked each month and the detection of a pathological marker localizes its emission from a small number, on the mean 6 x 103, cells. Moreover, the concentration resulting from the release of a given amount of markers in a capillary is reduced after dilution in the entire circulatory system by 10 orders of magnitude. At the present stage of knowledge, the hypothesized swarm is certainly far from being producible, but it is not an (irrational) dream because most of the critical steps required for its preparation have already been established. Consider a silicon-based chip with size and shape allowing it to flow through the capillaries, say with 2a x 2b x h = 30 x 4 x 2 μm3 (obtained, for instance, by etching the substrate from a device built on a silicon-on-insulator substrate) whose outer surface is almost completely coated with a biomimetic material designed to not activate immune response of the organism. This chip sketched on the figure near a neuron has a size allowing it to explore the whole organism through the circulatory, lymphatic, or secretion systems. Mastering the numerous activities of the nanobot (sensing, recognizing of the chemical pattern, controlling the motion, managing the power, and so on) requires a minimum of intelligence. Starting from the reasonable assumption that in the next 10 years integrated circuits will attain a density on the scale of 1011 cm-2, a chip of area 102 μm2 can host 105 devices. A 100-kbit circuitry is expectedly able to manage the information coming from a few (of the order of 10) sensing regions, each specialized to the identification of a different metabolite. The swarm may be formed by sub-swarm, each addressed to set of metabolites characteristic of the target tissue. The population of the various sub-swarms must be tuned to have an optimal surveillance of the organism. The integration of computation and chemical sensing in the same circuit is not easy. In fact, logics and memories are built in such a way as to decouple as far as possible the electronic device from the outer world. The basic constituents of the electronic circuit, the field-effect transistors (FETs), are usually buried beneath approximately 10-20 dielectric and metallic layers of total thickness of a few micrometers; if the transistor is produced via the silicon-gate technology, the exposure to the outer world of the FET core - the gate oxide - is even conceptually impossible. On another side, a new paradigm based on the crossbar structure has been proposed for the post-CMOS (complementary metal-oxide-semiconductor) era. The crossbar allows a cross-point density even larger than the one achievable by CMOS FETs at the end of Roadmap, may be embedded in standard CMOS circuitry, can be built in the back-end stage of the fabrication process [6-8], and can thus be easily put in contact with the environment. Reference  suggested a route for the crossbar functionalization via the growth of carbon nanotubes with a pattern consistent with that of the underlying crossbar. 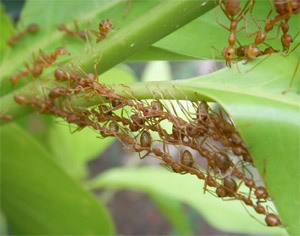 In swarm of macroscopic robots, individuals communicate by using appropriate signals. Within this scheme Reference  proposed that each nanobot stores specific chemicals to be released for detection by other nanobots. Another approach (which, at best of our knowledge, has not been investigated yet) can be based on the fact that at the microscopic scale collision is not an issue. Consequently, communication between nanobots can happen through direct physical interactions. To show how direct physical interaction can be exploited, consider the nanobots task of clustering around unhealthy cells. The usefulness of this task follows from the fact that if this cluster is sufficiently large, it can trivially be imaged via x-ray computerised axial tomography. A more sophisticated application exploits the fact that the cluster may become large enough to behave as an antenna, able to send an electromagnetic pulse to the central units - the transmission of radiation in the millimeter band would require the clustering of ∼ 10 nanobots only. For a swarm of 106 agents, a nanobot anchored to a capillary wall will on the mean interact with another nanobot each three days, so that a cluster suffciently large to inform the central unit will be formed in approximately one month. 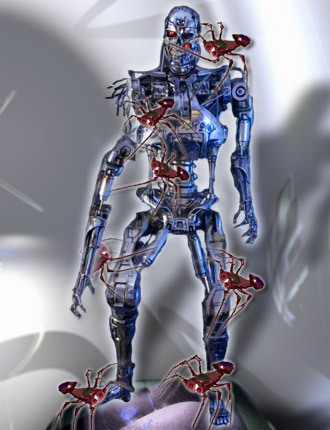 As far as each part of the organism may develop potentially lethal endogeneous diseases (we have especially in mind cancer), the nanobots must be able to explore all the organism. For that, mimicking the carriers of the immune system (the white cells), the basic idea for exploring the whole organism involves the exploitation of the blood circulatory system. Any cell, indeed, to preserve its vital functions must continuously be fed with the carriers of neg-entropy (sugars and O2) and the waste products (CO2 and partly H2O) must be taken way. In turn, that is possible only if all the living cells of the organism are within a diffusion length from the capillary system. Thus, as far as the nanobot has a size comparable with that of blood cells, it can explore the whole organism (within a diffusion length). Materials at the web page were presented by Professor Gianfranco Cerofolini and Dr. Paolo Amato from the University of Milano Bicocca, Italy. Photo art by Natale & Dvight Hanson. D. Arbuckle and A. A. G. Requicha, Active self-assembly, Proc. IEEE Intl. Conf. on Robotics and Automation - ICRA 04 (New Orleans, LA, 2004) p. 896. E. Bonabeau, M. Dorigo, and G. Theraulaz, Swarm intelligence: from natural to artiﬁcial systems, (Oxford Univ, Press, New York, NY, 1999). A. Cavalcanti and R. A. Freitas, Jr., Nanobotics control design: a collective behavior approach for medicine, IEEE Trans. Nanobioscience 4, 133 (2005). A. Cavalcanti, T. Hogg, B. Shirinzadeh, and H. C. Liaw, Nanobot communication techniques: A comprehensive tutorial, Intl. Conf. Control, Automation, Robotics and Vision, ICARCV 2006 (Syngapore, 2006) p. 1. A. Cavalcanti, B. Shirinzadeh, R. A. Freitas, Jr, and and T.Hogg, Nanobot architecture for medical target identifcation, Nanotechnology 19, 015103 (2008). G. F. Cerofolini, G. Arena, M. Camalleri, C. Galati, S. Reina, L. Renna, and D. Mascolo, A hybrid route for molecular electronics, Nanotechnology 16, 1040 (2005). G. F. Cerofolini, P. Amato, and E. Romano, The multispacer patterning technique: a non-lithographic technique for terascale integration, Semicond. Sci. Technol. 23, 075020 (2008). 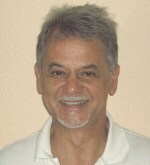 G. F. Cerofolini, Nanoscale Devices (Springer, Berlin, 2009). R. A. Freitas, Jr., Current status of nanomedicine and medical nanorobotics, J. Comput. Theor. Nanosci. 2, 1 (2005). R.A. Freitas, Pharmacytes: An ideal vehicle for targeted drug delivery, J. Nanosci. Nanotechnol. 6, 2769(2006). T. Hogg, Distributed control of microscopic robots in biomedical applications, in Advances in Applied Self-organizing Systems, edited by M. Prokopenko (Springer, New York, 2007) p. 147. J. Monod; Le Hasard et la Necessité (Editions du Seuil, Paris, 1970). A. A. G. Requicha, Nanobots, NEMS, and nanoassembly, Proc. IEEE 91, 1922 (2003). J. D. Watson, T. A. Baker, S. P. Bell, A. Gann, M. Levine, and R. Losick, Molecular Biology of the Gene, 6th edition (Pearson, 2008).